One of the proverbial Holy Grails of social marketing has been to get your brand to trend on Twitter. It signifies scale and social value of your brand, it’s easy to explain, and not everyone can do it. Or can they? First, let’s begin with some definitions. What does it mean to trend on Twitter? It means appearing in the top trends box on Twitter’s home page and mobile app. The trends are tracked and viewable at a global, national and city level. Trending topics represent what people are talking about the most at a given time. But it’s not just a traditional word cloud, tracking individual words — rather, Twitter uses an algorithm to identify the larger conversations related to topics and distill them down to hashtags and keywords. By clicking a trending topic, you can see all related tweets, profiles, and headlines. How does something become a trending topic? The most certain way to trend on Twitter is to pay for it using Twitter’s Promoted Trends product. These opportunities are offered once per day at a fixed rate — typically $100,000 – $200,000 for 24 hours. While this is a surefire way to get your brand in front of the massive Twitter audience, what we’re discussing today is how to do it the old fashioned way: organically. There are a few things to note about organically trending topics. First, there’s no telling how long or short their time to trend is going to be. 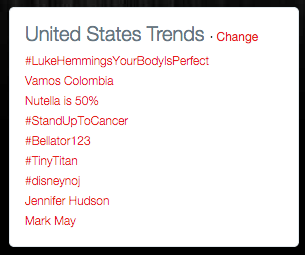 I’ve seen trends last less than 20 minutes and up to a majority of the day. It really comes down to the size and nature of the audience that’s engaging — that is, fans of One Direction and Justin Bieber are incredibly passionate and show up in the millions to create organically trending topics quite frequently. Second, a big part of the algorithm that causes content to trend is based on two things: frequency and volume over time. That is, the more people are tweeting about a given topic in a shorter amount of time, the more likely that content is to trend. This is why you see topics related to live television like sports and The Voice trending — the viewership is so massive and active on social media that, at any given time, thousands upon thousands of conversations are occurring about these cultural events. So, what does this mean for me and my brand? When it comes to trending topics, there’s a lot to do with chance — right content, right time — but there’s an equally important part that can be affected with the right strategy to put your best foot forward. Here are a couple thought starters that should get you on your way to your first trending topic. What better way to replicate the momentum achieved by a live television or sports event than to create one of your own? I’m not saying you need to produce a television show or host the next Dodger game. Quite the opposite, in fact. You can create an online event targeting a smaller but passionate audience. The most common example of such an event is a Twitter Party — an event hosted by a popular Twitter personality, centered around a hashtag, and designed to get their audience talking about a topic. Another type of live event that I have personally seen success with is a live trivia event. Working with a gaming client, we devised a program that offered up high value prizes to the first Twitter follower to answer each of a series of increasingly difficult trivia questions using a designated hashtag. We hosted a similar event for four weeks and organically trended three of the four times. Don’t have the means to make an event of your own? You can try appealing to the masses with something that holds a universal truth or can be entertaining to everyone. A program I created for the same gaming client was designed to tap into the passion around nostalgia for a particular franchise and the result was the topic trended within the first 10 minutes of publishing the original tweet. It comes down to understanding your audience and their motivations. What are they passionate about at scale?